TekMark Australia has introduced two new instruments in Tektronix’s range of entry level 2-channel oscilloscopes. Tektronix’s TBS1000B-EDU and TBS1000B series of 2-channel oscilloscopes feature across-the-board enhancements such as a high-resolution 7-inch display, dual channel frequency counter and 34 automated measurements, representing the best value entry level oscilloscopes for students and teachers as well as supporting a wide range of general commercial applications including basic research and development. Similar to the strong demand around the world for affordable and highly capable oscilloscopes that can help engineers and technicians design, verify and debug electrical systems, there is strong global interest in giving students hands-on experience with oscilloscopes. 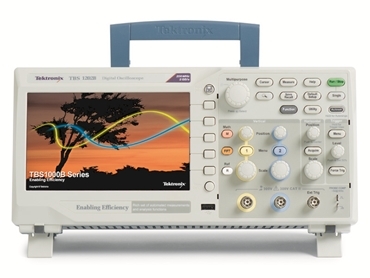 Beginning with the TBS1000 Series introduced in November 2012, Tektronix has progressively increased its focus on education while adding new capabilities that further improve convenience, efficiency and versatility for all users. According to Jeff Yost, director, Basic Oscilloscopes at Tektronix, while many vendors overlook the entry level, the company is delivering important innovations such as integrated courseware, 10x oversampling on all channels for improved signal accuracy, and advanced analysis capabilities in this class. The TBS1000B-EDU series offers the first oscilloscopes in the industry with an integrated courseware system designed to help students learn more efficiently and effectively while minimising the time instructors need to spend preparing and conducting lab sessions. With integrated courseware, instructors can make their lab exercise content viewable on the oscilloscope and students can conveniently capture lab results straight from the instrument. Tektronix is also developing an integrated content ecosystem that includes PC-based courseware editing software and a Tektronix website where a selection of pre-made course content can be downloaded for use on a TBS1000B-EDU instrument for free. Instructors can also use this platform to upload their own course material, viewable on other TBS1000B-EDU instruments, to share with the wider education community. Designed to address basic R&D, service and repair, manufacturing and electronics hobbyist applications, the TBS1000B oscilloscopes are capable of performing daily measurement tasks more accurately, efficiently and conveniently than comparable oscilloscopes in this class. General purpose models come equipped with additional functions including enhanced data logging, a limit-test feature to define pass/fail masks for complex signals, and TrendPlot for capturing and monitoring small measurement changes over long time periods. Key features of the TBS1000B-EDU and TBS1000B series include an always-on sampling rate of up to 2 GS/s providing 10X oversampling on all channels all the time; a 7-inch high-resolution WVGA display; 34 automated measurements types to maximise efficiency; bandwidth range from 50 MHz to 200 MHz; and an unrestricted class-leading 5-year warranty.